Light. - lle Haute light is shown from a skeleton tower, 40 feet (12 m) high, situated on the highest point of the island. 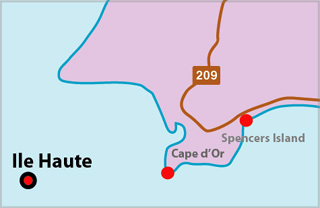 Minas Channel, the approach to Minas Basin, is entered between Morden and Cape Chignecto, situated 13.5 miles north. Cape Chignecto, the SW extreme of the promontory dividing Minas Channel from Chignecto Bay, is a bold, conspicuous headland. The land near the cape rises rapidly to over 700 feet (213 m). 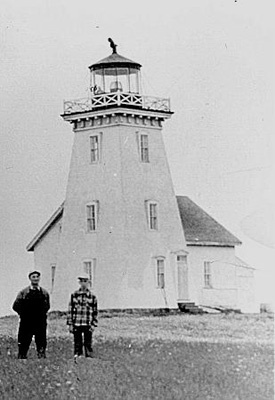 lie Haute, 320 feet (97 m) high, is situated about 5 miles SSW of Cape Chignecto; there are cliffs all round the island except at the east and west ends. A stony spit extends about 0.4 mile ENE from the east end of the island, but elsewhere it is clear of dangers. There is an anchorage in 12 fathoms (21.9 m) about 0.3 mile north of the east point of the island. There are tide rips close north and south of the island. Tower Height: 053ft feet high. Light Height: 365ft feet above water level.